DC’s putting out a ton of great books right now, lead by a handful of fantastic Batman family titles like Batgirl and Grayson. Gothic boarding school girl manga-by-way-of-Batman Gotham Academy’s my pick for the best of the bunch. The Big Two have only recently gotten comfortable with superhero comics that aren’t necessarily superhero comics (R.I.P. She-Hulk), and what’s great about this book is that you can enjoy it as a weird little corner of Gotham City and a pretty unique comic in its own right. 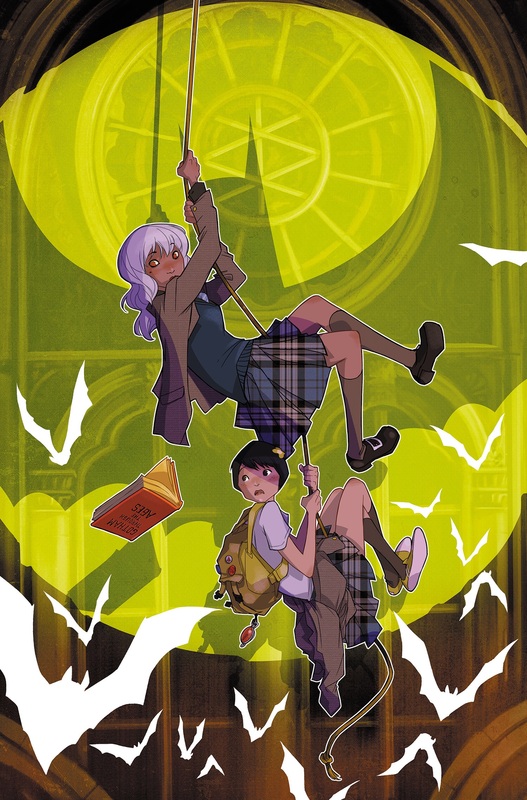 Gotham Academy’s simultaneously an interesting reinvention of Batman supporting cast mainstays like Killer Croc and a Nancy Drew-style adventure story. Cloonan and Fletcher lean hard into teen melodramatics (up to and including a classic boy-girl-Manbat love triangle and lead character Olive’s blossoming powers) that works because it’s so earnest and anchored by such likeable characters. Kerschl—and a host of colorful guest artists—imbue the book with a really well-defined style in everything from the design of the school grounds to Maps Mizoguchi’s journal scribbles. There are a number of Marvel and DC title designed to appeal specifically to me, Gotham Academy is the kind of series I can hand to a friend who isn’t necessarily a comics diehard. IDW’s Jem and the Holograms comic, on the other hand, is a colorfully cool, modernized retelling. Kelly Thompson’s writing sticks to the heart of the series—Jerrica Benton discovers the supercomputer Synergy that transforms her and her sisters into fabulous band Jem and the Holograms—while still being accessible to new and younger readers. The characters are allowed to grow and breathe a bit outside the rigid confines of 1980s cartoon writing, most notably in depicting Kimber and Stormer as a star-crossed lesbian couple. (Cue the happy ‘shipper screaming.) Thompson also puts a refreshing spin on the pink-haired protagonist, exploring how the Jem identity works as a kind of Magical Girl alter ego for shy, stage fright-afflicted Jerrica. What truly makes Jem a standout book is the fantastic artwork by Sophie Campbell, whose character designs are cute, ferocious, and strikingly fashion-forward. While many mainstream comics still struggle to depict women as anything other than generically skinny mannequins in different wigs, Campbell’s women—with all their diversity in body shapes and facial features—feel vital and important. 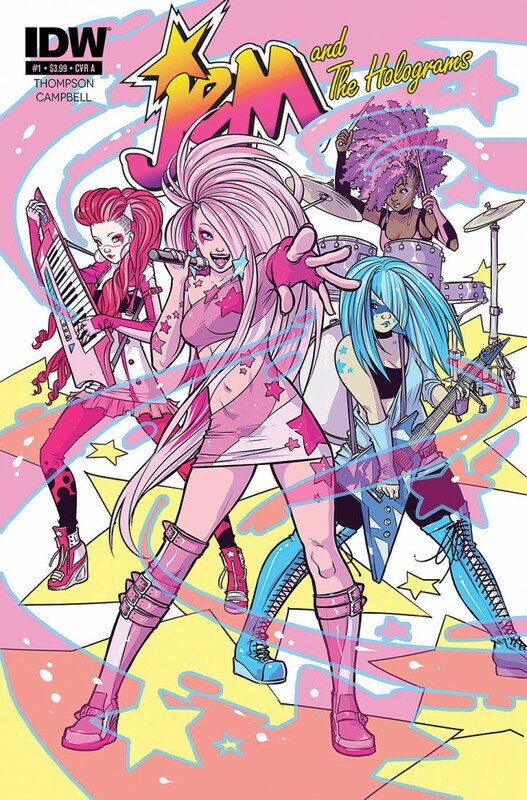 Jem is a fairly new series, and I hesitated picking a book that hasn’t even completed its first arc as my “favorite ongoing comic,” but honestly, I couldn’t think of another title that matches my excitement for Jem and the Holograms every month. It’s outrageous. 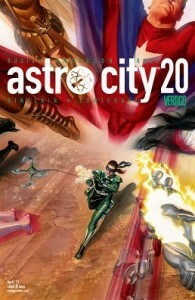 It seems appropriate to reflect upon Astro City with its 20th anniversary coming up. Though it hasn’t been a constant presence on the stands, with long stints between series during that two decades, it’s been a consistent favorite of mine. Detailing the history of a superhero universe that combines aspects of both DC and Marvel, Astro City is about the people that populate that universe, mostly in the titular city. Digging into the lives of those characters is what separates it from most other superhero comics; while there are still big fights and alien invasions to be dealt with, those are mostly in the background as Busiek and company are more concerned with what motivates these characters to be heroes, or not to be in some cases. A few arcs in the most recent series have dealt with people with powers who just don’t want to be superheroes, but still want to help people. It also focuses on those who don’t have superpowers, but live their day to day life in a world full of them. It’s a fascinating look into what happens between the panels of other superhero comics, and is all the better for having run for so long. Brett Anderson has illustrated almost every issue of the series (with Jesus Moreno and Graham Nolan recently being brought in to allow for the current series’ monthly schedule), and his work is perfect. He draws in a timeless style that fits the material because it so often bounces throughout the history of the city. He’s equally adept at drawing the funky getups of seventies cosmic heroes and the over-armored nineties look of that more “gritty” age, but he does it in a fashion that makes each look of their time but part of a cohesive universe. Cover artist and character designer Alex Ross also deserves a lot of praise. While I’m not generally a fan of his, his Astro City work is best he’s ever done. He’s painted every cover for the series, and his investment is clear. His designs for the characters have an amazing way of reflecting the archetype they are patterned after while not coming across as copies of established company-owned characters. The current series of Astro City, with it’s 26th issue out next week, is the longest running volume thus far, and it shows no sign of any drop in quality. As someone equally obsessed with so many corners of popular culture, I have a hard time staying consistently engaged with any one piece of work. I only keep up with maybe two TV shows on a weekly basis live as they air and just binge everything else when time allows. I treat comics the same way. While I love the rewards reaped from following a title over the course of years rather than months, very few ongoing series get me giddy enough to check in on a routine basis. Saga is probably the best example of this anomaly. It isn’t that Saga has the best story, or the most inimitable art. Sure, I love the characters and the themes and everything else about the canny, postmodern space opera, but I can rattle off tons of other titles I think trounce it by whatever criteria one can list. What makes Saga special for me is how wonderfully Vaughan’s plotting utilizes the serial format. Each bite-sized chapter is brisk enough not to be boring, while packed with just the right amount of information and resonance to be worth obsessively re-reading while you wait for the next installment. That’s the real fun of any good ongoing series—that inescapable void between every cliffhanger and the revelatory first page that resolves it. 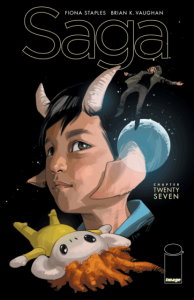 Saga might not be the best comic on the stands, pound for pound, and I’m not even certain it’s my favorite, but I can’t think of another one quite as addictive. Your turn, kiddos: what’s your favorite comic on the stands right now? Comment below. It’ll be fun. C’moooonnnnnn.